As a driver, you have a right to expect the roads you travel throughout North Carolina to be properly designed, built, and maintained. When road hazards such as potholes or debris cause a crash, you also have a right to demand compensation to help you recover from your injuries. The skilled Charlotte car accident lawyers at Warren & Kallianos, PLLC have extensive experience securing full and fair compensation for clients who have suffered serious injuries in car accidents from road damage. If you are coping with severe injuries after a crash caused by road hazards, schedule a free, no-obligation case consultation with our team now. If a road hazard caused your crash, let our dedicated legal team fight for your right to full and fair compensation for your injuries. What Is the Most Dangerous Roadway in North Carolina? Who Is Responsible for Accidents from Road Damage? Government agencies and municipalities: Although different rules apply when filing a claim against a government agency or municipality, you do have a right to demand compensation from those that fail in their duty to safely design, build, and maintain roadways. Private companies: In some cases, fault may lie with a private company that was hired to design or build a road for the government. Private companies may also be held responsible if they failed in their duty to properly maintain roadways, resulting in a crash. Landowners: If your wreck happened due to hazards in a parking lot or on private roads, you may seek compensation from the landowner responsible for the premises on which you were harmed. When pursuing a car accident claim related to hazardous roadways, it is important to have an experienced attorney on your side who has handled these types of cases before. Particularly if your claim involves a government entity, you need an attorney who understands the complexities of these types of claims and can build a strong case for compensation. 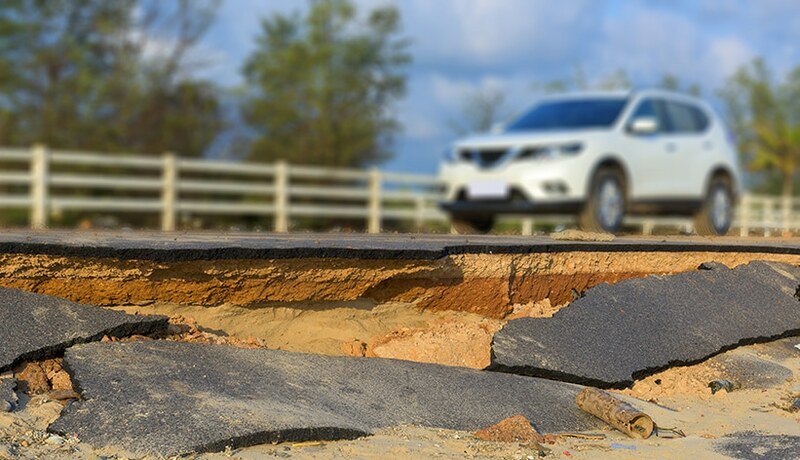 If you have suffered a serious injury and property damage because of the negligent maintenance of a local or state road, you will have to file a claim against the government. If you want to sue the state of North Carolina, you will need to work with an attorney who has experience with The North Carolina Tort Claims Act, which is Section 143-291 of the North Carolina statutes. If you are filing a claim against the state for your car crash that was caused by a poorly maintained road, you would be filing your claim under this rule. After any crash caused by road hazards, it is crucial to start collecting evidence as soon as possible. Without a timely investigation, much evidence can be lost or destroyed before it is documented ─ either by accident or because the responsible party wants to correct any safety hazards right away. Every piece of evidence we can gather will play a role in building a strong claim against the responsible party. In addition, our legal team will collect your medical records and enlist the help of medical specialists to determine the severity of your injuries and calculate what full and fair compensation could be in your case. Our knowledgeable Charlotte auto accident lawyers stand ready to help you after a crash caused by road damage. You can count on our dedicated legal team to track down all the evidence and craft a concrete claim in your case. Do not wait any longer to start working on your car accident claim. Every day that passes is another day that evidence is lost, and you may already be facing strict time limits if you are filing a claim against the city, county, state, or other government entity. Did a hazardous roadway in Charlotte lead to your injuries? Call 704-275-5593 or fill out our contact form today, and schedule a free consultation with the experienced legal team at Warren & Kallianos. We do not charge any fees to get started on your case, and we only get paid if we recover compensation for you.